A friend of mine is having a 50th birthday this coming weekend. Unfortunately I can't make the celebration as I'll be around 500kms away, but I thought I could make her a small gift. So I worked out this table runner. I thought I'd give it a go on this one too. Pretty happy with the result. And fortunately I had just enough of the olive green to make the binding. I'll be finishing up that hand sewing around the binding tonight so that I can pass it on tomorrow. Here's a shot of the backing which is featured on the front as well. I think my friend will like it. What's your 'go to' gift for a friend at short notice? Lyn~that is a very pretty runner, love them both! The second one you showed-is that your own pattern, I like it! 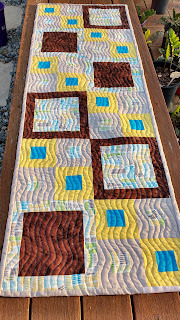 Love the wavy lines quilting - so neatly done. I am sure your friend will love the gift and this will mean so much to her. Hello Lynn; Both of these table runners are fabulous! I adore the fabric combinations that you chose and especially the background and backing fabric. Yet, it may be that vibrant pop of blue that really draws my attention. In any case, you did a marvelous job in creating both of these table runners and I am sure your friend will just love her gift! I am sorry I have missed so many posts, a few health issues. I hope that you have a great day tomorrow! Handmade gifts are the best! I don't have a go-to gift, ha, I usually just wing it. For special birthdays for special people, I make them a quilt. This is a happy runner! Very pretty! I rarely make quilts as gifts, with the work and family schedules, it's hard to know if I'll have time. What a wonderful gift! I really love the wavy quilting, and the colors are just perfect!